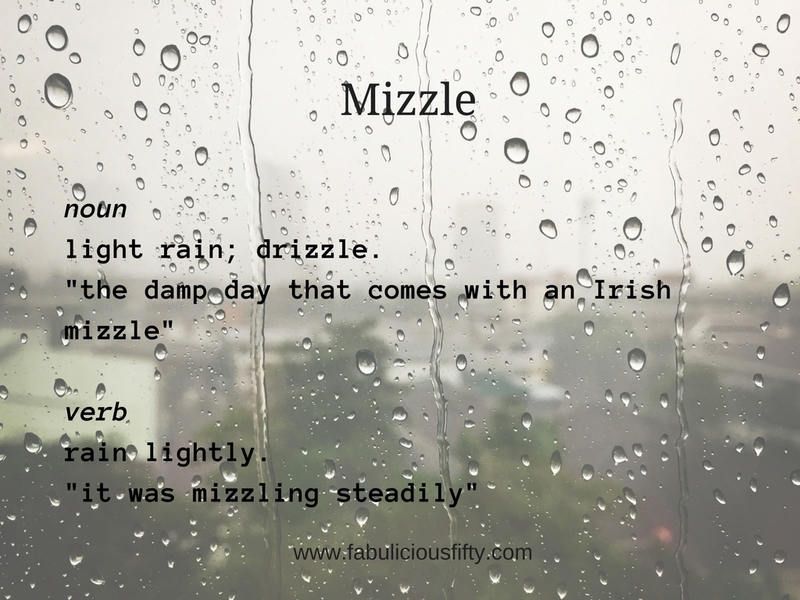 Mizzle – Words I Love! I love words. They are more powerful than we think and are an art form in themselves. Finding a new word for me is a little like finding a treasure and then having the joy of exploring it, turning it over in my mouth and learning how to pronounce it and then finding a way to weave it into conversation. In this new series on my blog I will be choosing a word of the week, and sharing what that word means to me. Today’s word is mizzle. Isn’t it a cool word it means really fine rain that is almost like mist? Mizzle is thought to be a late English word and to be derived from the word mist. In Ireland we have lots of mizzle,and today have had some fairly steady rain interspersed by mizzle. When I wake up to a good mizzle, I give myself permission to take it easy. Perhaps skip exercise today and treat myself to a snuggle on the sofa with a good Netflix movie or something light-hearted. I am currently watching The Good Place, which is fun, interspersed by Orphan Black which is anything but fun – it is a dark drama that is almost compulsive as it draws you into the world of cloning in such a believable day. A good mizzle is also an excuse for comfort food. Perhaps a day to make my store cupboard tomato soup, or even indulge in something naughty if I have it in the house. Mizzle calls for gallons of tea, a good read – currently reading the latest Marian Keyes novel, Broken. Marian Keyes writes so easily that you can be excused for feeling that you know the characters personally, and in some cases relate. I was interested to find another definition of mizzle as a verb describing someone who suddenly goes away or vanishes.. He mizzled into the crowd. Hopefully I get to use the first definition more often than the alternative. I don’t like people going missing. Loving words is a great way to contemplate and gain focus. If you are someone who meditates you can even meditate on the word, simply repeating it over and over until it leaks into your subconscious. Thank you for reading my word this week.